Recently, I’ve had the benefit of participating in several threads with colleagues who have an extended military background. With my momentum regarding performance support at Point-of-Work they are quick to defend the importance of training, and I don’t disagree for a second. But there is more to their story that must be pointed out. Training alone is not enough. Gaining competency is not accomplished during a training transaction – by itself, it is not enough! The training regimen followed by our military does something that truly reinforces excellent training – practice, practice, and then some more practice…and that happens at Point-of-Work. While it’s true practice happens on a range or in a realistic simulation, they still use the support and the technology when deployed into a live environment. No team, regardless of role, becomes proficient without being fully immersed into this regimen. The military does something very well that the rest of us could perfect. Training/learning is continuous…but to be truly continuous…it should be converged with work, either practice or real. Learning and gaining proficiency are accomplished on a Learning Performance Continuum extending beyond training and that follows closely with the framework of 70:20:10. One continuous element is the efficient use of Performance Support embedded in multiple role-specific, task-centric scenarios simultaneously. Performance support becomes embedded within formal training (the 10%). Performance Support is also embedded continuously as collaboration during training and beyond at Point-of-Work (the 20%). And…Performance Support uses the aggregate of collaboration and available technology for contextual, real-time information, resources, and learning delivery at Point-of-Work (the 70%). Think about how effective a sniper would be in the field without hours upon hours of training, practice, and close support by his/her spotter. Without real-time collaboration that gauges distance, humidity, windage, and observation, how effective would their role and task-level effectiveness be? The continuity of learning and task-level execution are mission-critical in a military work environment. Is mission criticality in our corporate environment any less important? Granted the outcomes are less lethal, but are they less mission-critical? Don’t let Change Leadership appearing last on the list above denote a post-convergence drill. Leading and managing Change is as continuous, pervasive, and dynamic as the corporate mission and the learning performance ecosystem supported. Methinks the time has come to put a few holes in our outdated Training Paradigm that sports lingering blind spots that restrain the convergence mission. 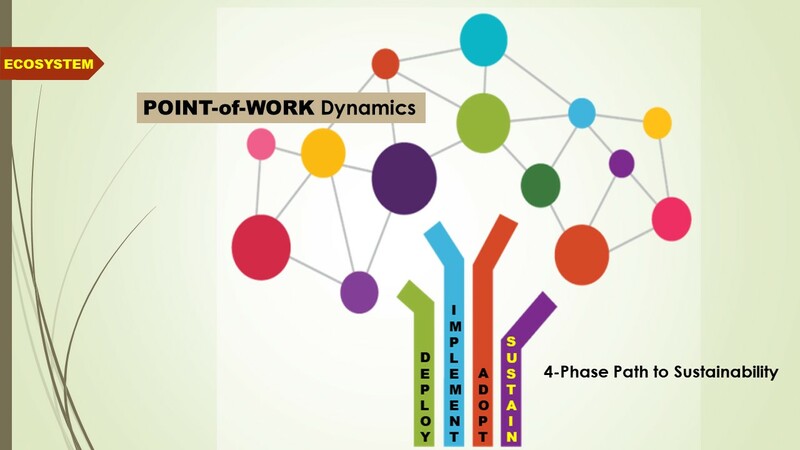 A Point-of-Work Assessment – PWA methodology to benchmark current state has proven to be a great beginning to remove those blind spots and pursue an adoption journey to workforce performance and sustainability. Thanks for reading and take good care!